When I first heard that Michael Travers from Travers bikes wanted people to ride his new bike I jumped at the chance, well why wouldn’t you. The bike’s name is “ Mud”; now for me; my mud bike is a twenty year old full suspension Marin, which has worn frame pivots so the rear end can float all over the place which makes for an interesting hard ride. I had an idea that this bike would be a hash of components found in the clearance bins of CRC and Wiggle with no real thought behind it. 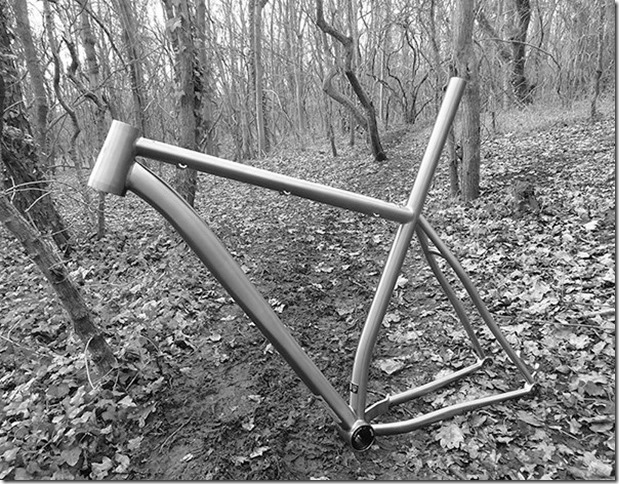 Then I looked at the spec sheet, a Carver Exocentric bottom bracket, a Shimano Alfine 11 speed rear hub, full titanium frame with a carbon fork (specially designed for this bike) and it becomes clear a lot of work and time has gone into designing this bike. 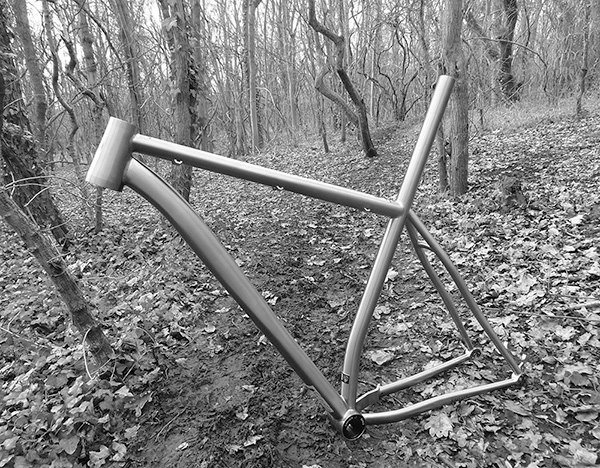 Looks alone, this bike is special (I’m assured the mk2 frame will look even better) the titanium frame and handle bars mated to the carbon forks, all branded Travers Bikes components with the big 29” wheels made me drool but what does it ride like, because that is what matters. Having never ridden a rigid bike off road I was a little apprehensive at first, but Michael like the true gent he is, told me to get on with it and stop looking for excuses. After a little gentle start to the ride, me on my big wheeled Trek, (I do like big 29er wheels) we set off on the first down hill wooded section, which I do struggle on to keep a decent pace, but no surprises Michael was gone. When he finally eased up and I managed to catch him, I made my excuses about not being good at downhill trails but only to defend my riding prowess. After a while we switched bikes, first little issue, not with the bikes but our shoes, Michael uses Look and I Shimano so no clipping in on this ride. Whilst we were stopped a dog walker ambled by and stopped to look at the “mud” bike, turns out he is an MTB’er also and was mightily impressed with the look of the bike he saw before him. Off we set Michael leading through Hockley woods and me trying to keep up, first difference is the gears the 11 speed Shimano Alfine hub changes immediately, you just have to ease the pressure off the pedals and click, and it’s in. A nice feature with this system is at standstill select any gear and that’s it ride off with it in that gear, no spinning the pedals over to change the chain on to different cogs. It wasn’t long before Michael stopped and commented about the buzz through the bars on the Trek and the very twitchy feel from the front end (I had got used to it). Maybe that’s why going quick down through twisty trees isn’t my forte in life, a dodgy bike. Interesting thing is that on the mud bike, I was having no buzz or vibration from the handle bars, even though it has a solid front end. The seating position was great and allowed me to drive hard out of the corners, even the back end of the bike was a lot comfier than my Trek. The titanium and carbon mix really does smooth out the trail and now I’m wondering why I bought a full aluminium bike when it’s so uncomfortable to ride, especially when it cost’s more than the Travers bike. The brakes like all top hydraulic systems work excellently with no affect on the stability of the bike even when used with force. The whole package just gels together, I even tried popping the bike up off the ground over some of the large roots to try and upset the bike; I didn’t even feel any difference on the landing with the rigid forks. The bike changes direction effortlessly with no feeling of the front end tucking under which I become accustomed to on my bike, even tight switch backs through the trees and avoiding the worst of the mud were all taken in it’s stride. I have to point out here that the trails were mostly dry when I rode this bike, so why does he call it a mud bike, I guess like mud the name just stuck. 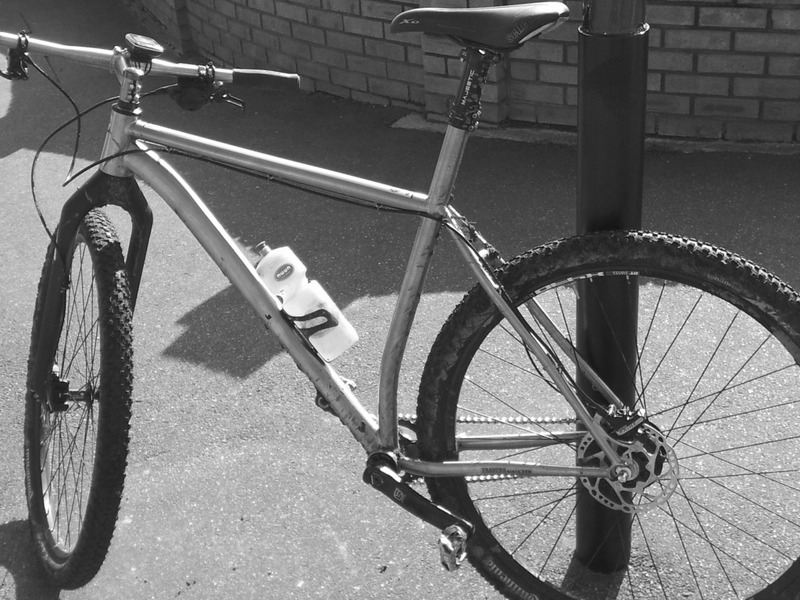 This bike although originally designed as a winter mud bike actually makes sense all year round, especially the mk2 frame version with rear drop outs and points to hang the rear mech should you wish to use conventional hubs and gears. 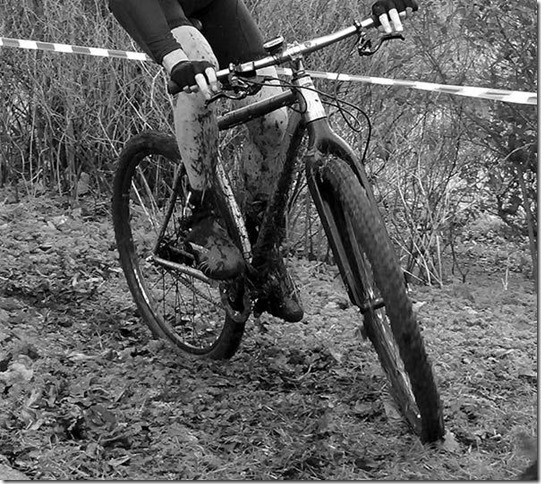 Now the question is would I buy one over a more traditional MTB, well the answer is a great big yes, which brings me to the title of this article, I was going to call it “why did I spend money on an awful bike” or “Travers mud turns to gold”, but I settled for “the mud bike” a simple title for a simple bike. Like Ronseal say “it does exactly what it says on the tin”, a mud bike for riding in the mud. Get home on a dark cold winter evening, lock it away in the garage and next time you want to ride it get on and go, nothing is going to seize up, jam up, rust solid or fall part, even the frame and fork will wash clean with no marks left on the material. A bonus for me as I’m lazy when it comes to cleaning my bikes, one simply does not do it; unless one has to. Another question springs to mind, why do we pay out loads of money having the latest, bestest and trickest suspension on an XC bike? 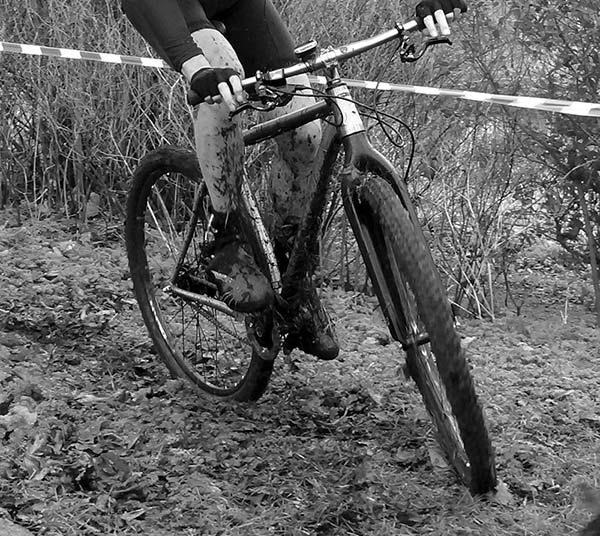 After riding the rigid mud bike you simply don’t need it on our trails here in the east of England. I was looking at buying a road bike to use when the trails get too boggy, so that I could keep riding, but now I have an alternative, buy a bike that I can ride through the boggy trails on. The best bit by far is that Michael will listen to what you want out of the bike and alter the spec accordingly to your desires, simply really. And as for riding on the road, nah; after all I am a mountain biker. This entry was posted in Review on 11/03/2013 by Hydey.